"The Endtime Prophecy", the 2nd full-length album of the Swedish doom rockers from MORTALICUM, will be released like the other 2 CDs announced before: on April 27th at the Keep It True festival. The band once again proves the quality of Swedish metal, bringing tons of classy and vintage sounding doom metal mixed with early '80s heavy metal and '70s hard rock, with emphasis on melody, soulful guitar solos and singing, and massive doomy riffs. The band's bass player and composer, Patrick Backlund, prepared a clip for the opening song on the album, "My Dying Soul" - check it out on YouTube! And here is a short promo clip for the album that we prepared. Find out more about "The Endtime Prophecy" on the page of this release. At the Keep It True festival we'll have a small table space to sell our releases, so if you're there and would like to buy the new MORTALICUM CD as a regular or tin-case edition (or any other of our releases), just come up to our stand! Our new compilation "Compendium Of Metal Vol. 5" will be released on the same day as well. 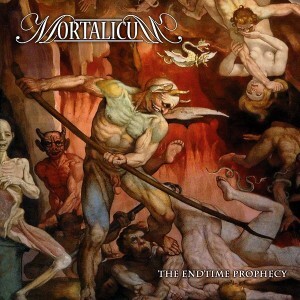 For the moment you can pre-order MORTALICUM "The Endtime Prophecy" CD from our SHOP page, with 2,00 Euro discount. We will begin shipping orders after April 30th though. The album will be soon available also for digital download through CD Baby, iTunes, Amazon MP3, eMusic and other retailers, as well as directly from us, from our new Bandcamp page.